Irchester United were founded as Irchester Excelsior in 1883, changing to the current name in 1895. Initially, the club joined Division 2 of the Northamptonshire League in 1896, but finished bottom of the league in their first season and left the league. They then spent time in local leagues, winning the Rushden & District League in 1929 and 1930, earning promotion back to Division 2 of the Northamptonshire League after the second title win. The club won Division 2 in each of their first two seasons, but were not promoted on either occasion. Instead, they left the league in 1936 after it reduced to a single division and changed name to the United Counties League. The club returned to the Rushden & District League, winning it at the first attempt and then winning it a further four times between 1947 and 1957. The club rejoined the United Counties League in 1969 in its Division 3, which became Division 2 in 1972. They finished runners-up in this league in 1974 to earn promotion to Division 1. This was followed by the club changing name to Irchester Eastfield in 1980, having merged with Wellingborough Eastfield due to a lack of players. 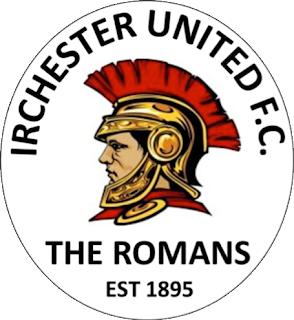 However, this name change didn't last long, with the club once again reverting to Irchester United in 1990. The next two decades saw the club struggle, finishing bottom of Division 1 on seven occasions, including three consecutive seasons from 2006/07 to 2008/09. However, the club then won Division 1 in 2009/10 to earn promotion to the Premier Division, where they stayed for three seasons before returning to Division 1, where they have remained ever since. In the FA Cup, the club has never won a game in its three appearances in the competition, while in the FA Vase the club has only made it as far as the 1st Round, which was achieved in the 2014/15 season: they beat Staines Lammas in a replay, then beat Crawley Green before losing 4-0 at home to Fakenham Town. After my previous groundhop at Ascot United, I set myself the aim of visiting one more ground to round off 2017 (more on why later), with the original aim being to visit either Oadby Town or Thetford Town last Saturday (the 23rd). 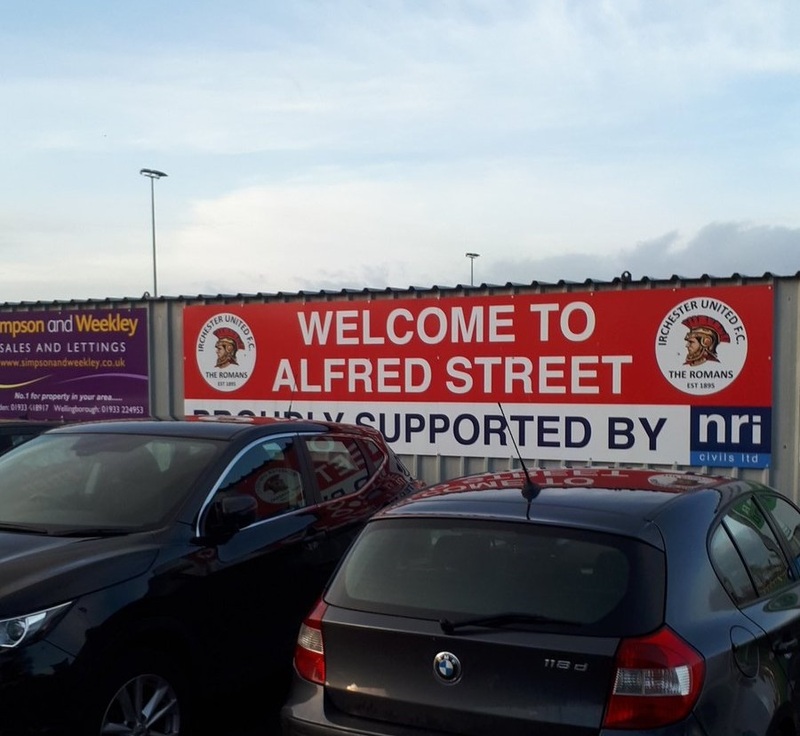 However, family commitments put paid to that idea, so I instead had to use yesterday for my final groundhop, which wasn't exactly ideal with Yaxley also being at home. However, plans didn't go much better for yesterday either, with my first choice at Raunds Town postponed because of a waterlogged pitch, and with two of my backups at Bourne Town and Rothwell Corinthians suffering the same fate (and with another one of my backups in Birstall United not updating their Twitter to say if there was a pitch inspection or not). This left Holwell Sports from my original five options, but my mum was reluctant to drive that far with a trip to Norfolk to visit family on the horizon. As such, I had to quickly look through the Groundhopper app to see if anything more local was still on and, as it turned out, Irchester ended up being an option and, with it also being very near the shopping centre that my mum, stepdad and sister had planned to go to while I was at Raunds (as had been the original plan), the choice was approved. After an uneventful drive to Irchester, I got to the ground around 20 minutes before kick-off, paying a surprisingly-low £3 for admission. It also turned out that there was no physical matchday programme, as the club apparently only issue online now (not as though I could find this online programme, mind you). In any event, I went round the ground to do my usual circuit of photos before opting to stand behind the near goal in front of the building housing the changing rooms; unlike how I normally do it, I decided not to buy any food or drink until half-time, and even then I only bought a cup of tea from the tea bar, which only cost 50p and was actually in a mug rather than some rubbish plastic cup like what seems to happen at most grounds. 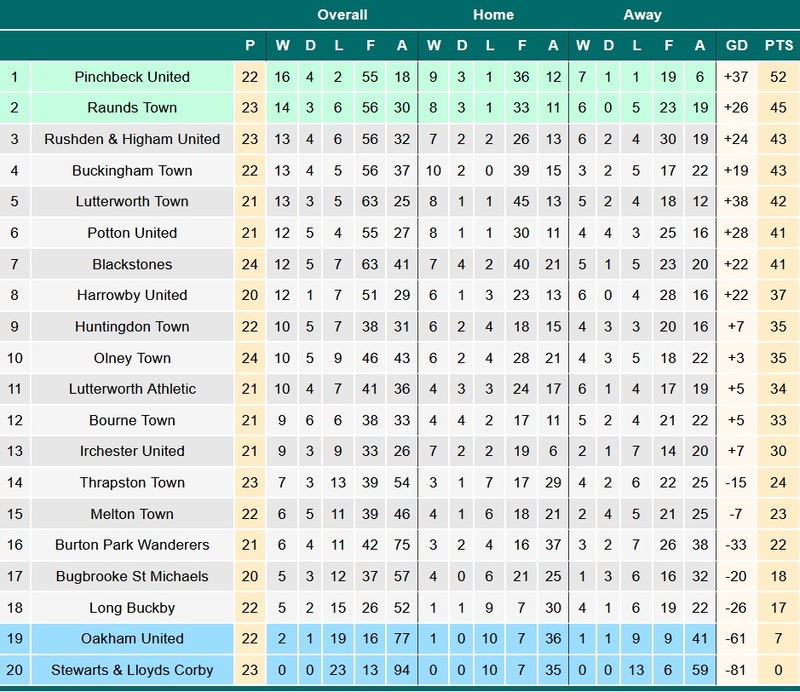 Looking at the table, it was clear that this would be a close game, but it was only when I looked at the teams' recent records that it occurred to me that I may not see much quality or many goals: Irchester were on an eight-game unbeaten run going into this game and hadn't conceded a goal since the 18th of November, which also included two 0-0 draws in their previous five games. 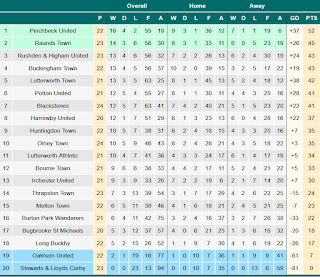 With Irchester being 13th and Melton in 15th before kick-off, I wasn't expecting much in the way of quality or excitement on the pitch, and this was reaffirmed once I saw Irchester's recent record (winning most games one or two nil and having two 0-0 draws in the last five matches). However, while my suspicions about the quality of football were more or less spot-on, I was surprised by how entertaining the game eventually became. However, I should perhaps strongly emphasise the word eventually above, as it took around 35 minutes for the game to come to life: prior to this point, both teams seemed more or less incapable of stringing two passes together (admittedly the strong winds didn't help on this front) and, as such, clear-cut chances were few and far between, with the only one of note coming on an Irchester attack after about 25 minutes when the number 10 had a shot from the edge of the box that the Melton keeper had to react to very quickly to get a hand on the ball and tip it over the bar. Other than this, the only notable chance in the first 35 minutes came when Melton's goalkeeper somehow dropped a ball that he should have comfortably caught, and he was then extremely lucky to grab the ball just before an Irchester forward got his foot on the ball and tapped into what would have been an empty net. While the first 35 minutes were easily the worst period of football I've seen this season (other than in the two games I saw at Carrow Road earlier in the season perhaps), the game suddenly came to life after this when Irchester got a free kick after 39 minutes: the ball was played across the box to Nathan Heycock, who turned and shot from the edge of the box to score. This had been in line with the general progression of the half (while both teams looked dreadful, Irchester looked more threatening than Melton did), but what followed next was some surprise. After Irchester's first goal, and while I was still writing down the details of the goal, Melton charged up the other end and caught Irchester napping, the ball eventually reaching Matt Hendley for a tap-in. Then, things got worse for Irchester when, after a corner was floated into the box, they needlessly gave away a penalty with a shove in the box on 44 minutes: Matt Hendley stepped up and calmly put the ball past the goalkeeper. Unfortunately, the second half started in a similar fashion to the first, with both teams constantly giving away the ball and then being wasteful in front of goal, with the only difference being that, for the first 25 minutes or so, Melton looked more likely to score and had several good chances that were either saved or wasted, as well as having a goal disallowed for offside after around 70 minutes, just as Irchester had been starting to grow back into the game a little: it was an extremely tight call and, ultimately, proved to be a turning point in the game (had the goal stood, I imagine that would have knocked the confidence out of Irchester completely, especially as they had just started to get some decent chances together). I say this because, in the aftermath of this, Melton started to become sloppy like in the first half and, on 77 minutes, Irchester were finally able to take advantage and equalise, a ball in the box reaching Nathan Heycock again (I think, but it was hard to tell from behind the other goal) who, with the goalkeeper bearing down on him, was able to quickly turn and volley past the keeper and into the net. After this, Irchester continued to press, while Melton tried to maintain their composure and keep the ball long enough to reduce the pressure. However, they could only hold out for another 9 minutes as, after 86 minutes, Irchester scored a third, a goalmouth scramble eventually being bundled into the net by Nathan Heycock for the hat-trick (again, not 100% certain on this, but that's who it seemed to be). After this, Irchester just tried to run down the clock, while Melton frantically fought for an equaliser which ultimately never came. Overall, while the quality of football on display was absolutely abysmal for large periods of the game, this was still an entertaining match, with the back-and-forth in the scoreline adding some much-needed drama. However, on the balance of play, I feel that Melton probably deserved a draw for their efforts, as there was really very little between the two teams (it is not at all surprising that they are so close together in the league table). 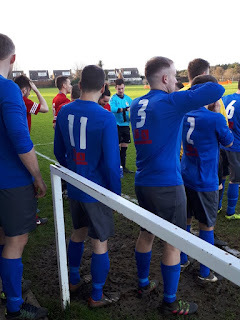 However, Irchester were able to show some character and, despite utterly crumbling at the end of the first half, slowly worked their way back into the tie and then managed the game well to hold onto the win: while I'm sure they weren't at their best today, it is easy enough to understand how Irchester are currently nine games unbeaten in the league. Overall, this was a far more enjoyable match and groundhop experience than I had expected, what with this game not even being on my radar at all before the start of the day: Irchester are another very friendly club and the whole place has a real homely feel to it, not least because of getting given a cup of tea in a mug (which is not something I've personally experienced before in my limited groundhopping experience). Now, with this being my last groundhop of 2017, it would be remiss not to have a look at my stats for the year, and for this season so far. While you can see the general outline above, there's a couple of extra pieces of trivia that make this particular groundhop significant. 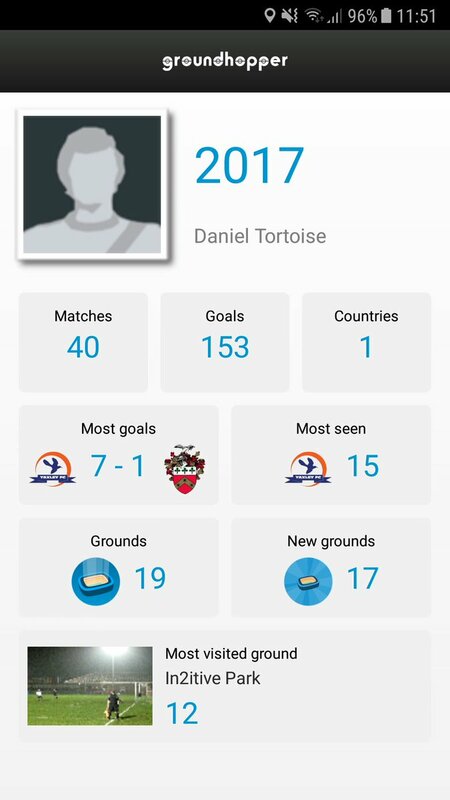 Above, I mentioned that after Ascot I was determined to fit in one more groundhop before the start of 2018, and there are two reasons for this: first, this was my 12th groundhop of the season, which is already the most I've ever done in one season (last season's 11 was the previous record); also, this was my 17th groundhop of the year and my 34th overall, meaning that in the space of 12 months I have doubled the amount of grounds I have visited, something which I don't know if I will be able to do ever again (I was determined to do it this year, as it would have been annoying to be just one short of it). 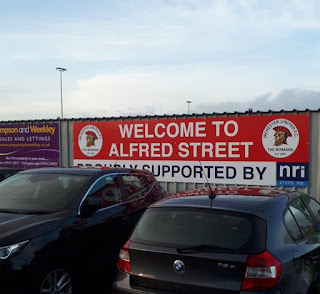 Alfred Street is perhaps the most basic ground I've visited so far, with only two-and-a-half sides of the ground having hard standing: the far side is off-bounds to spectators and doesn't even have a perimeter fence (due to the fact that the football club and cricket club share the ground), while only half of the area behind the far goal has hard standing, for some inexplicable reason; the area behind the near goal and the dugout side are both fully hard standing, though. In terms of cover at the ground, all of this is on the near side, with the main stand being a typical 100-seater Atcost, while there is also some cover and seating (in the form of small benches) in front of the building housing the changing rooms. Overall, the ground supposedly has a capacity of 1,000, but with only two-and-a-half sides open to spectators and with a tiny car park (room for at most 20 cars, at a guess), I would be surprised if the ground could actually handle that. As this suggests, the ground is very cramped overall, and there is little room for any real expansion, although I doubt the club will ever need to expand the ground much beyond its current state.